Friends occasionally seek my advice on raising venture capital, knowing I’ve been involved with a range of VC financings – from seed, through A, B, and C rounds, to investments by a “strategic partner,” to venture debt financing, through to trade sales. So whether you’re the long-range planner or the last-minute proposer, maybe you’ll find one of these right for you. On that April day, Dermot gave sage advice on our move to Ireland – a move he’d made a few years earlier with his American wife and three children. Last year, Dermot packaged into this book his sage advice for entrepreneurs needing to raise venture capital. Dermot’s advice, based on his time at Delta Partners, is less about “How to raise venture funding for the business you’ve created” than it is about, “How to create your business such so you’ll be able to raise venture funding,” a subtle but key difference. Dermot talks about organizing the business around fundable “stepping stones,” each a “proof point” that a VC will require. For those just starting out and wanting to plan the entire funding process in advance, the price of Dermot’s book will be the best investment you can make. If your planning window is a bit shorter, you’d do well to RSS Jeff’s blog, “Seeing Both Sides; VC Perspectives From A Former Entrepreneur.” Jeff, a partner at Flybridge, consistently provides advice intended to make the process go more smoothly for those of us still on the “seeking venture funds” side of the table. Two of his recent posts are particularly relevant. 1. 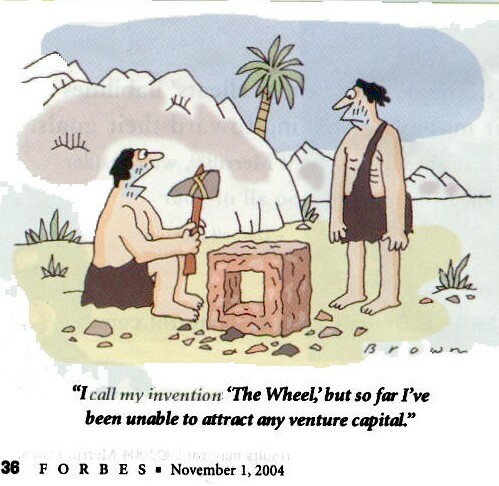 After seeing what the due diligence process will entail you might just decide not to even seek venture funding! Better to decide this up front and plan your cash flow accordingly. 2. If you decide to proceed with seeking venture funding, Jeff lists the requisite data / information you will need to have collected well in advance of the due diligence process. Life will go better if you collect this data as you are actually running the business, not waiting until you approach the funding process. 1. I’ve found that VCs often try to reduce risk by answering as many Series B questions in the Series A round. (Ditto answering Series A questions in the Seed round.) Therefore many of these “later stage” questions will be asked early in the process. Be prepared. 2. Jeff shows you the type of “proof points” that you’ll need to put into your operational plan early on. If you wait until it’s time to do the funding round, you may find it too late to collect the data required. Scott Painter’s advice – contained in a post by Carleen Hawn – deserves respect because he’s had so much success in raising venture capital. Painter calls it a numbers game, claiming you’ll have to make 120 pitches to get one VC check. 1. He has a technique for determining exactly which VCs actually take the time to look at your PowerPoint, and for preventing the VC from forwarding it to others. 2. He then has an intriguing three-meeting process he has used to successfully cement the deal. Check it out. Ignition Partners’ John Zagula’s advice is perfect for those who have not followed the longer-range planning advice of the above three elders and now find themselves just days away from making a big pitch to a VC. Zagula tells how to make that the pending pitch a winning one. Rather than offering a slide-by-slide recipe, Zagula’s post, contained in a brief article in Xconomy, provides just three tips on how to make a pitch interesting and relevant. In particular, I like his first tip about beginning with a personal story that is relevant and impressive. I passed Zagula’s advice along to a friend who promptly binned the 25+ slide presentation they’d labored over for months. Starting from scratch they followed a technique I learned from my wife; “blank slide” the entire presentation using 3 by 5 index cards, writing just one key point on each card – “Great team” “Defensible IP” “Cash positive in 9 months” – then organizing the cards into a logical order, and finally writing a crisp, interesting presentation – a story, really, based on the flow of these cards. So if you’re early in the process, buy Dermot’s book before you even start out. No matter what stage your business is at, take time to ready Jeff’s two posts so you’ll at least know what you’re in for. If you’re at the stage of sending off presentations to investors, use Scott’s technique for controlling and monitoring who is reading the presentation. And if you’ve already developed a presentation, determine if it meet’s Zagula’s criteria for interest and relevancy; and be prepared to start over from scratch! In all four cases, you’ll be glad you listened to the advice these guys have to offer. This entry was posted on 29 November 2008 at 8:07 PM and is filed under April Fools, Business, Carleen Hawn, Delta Partners, Dermot Berkery, Des Pieri, Desmond Pieri, Due Diligence, Flybridge Capital Partners, IDG Ventures, Ignition Partners, Jeff Bussgang, John Zagula, Jules Pieri, Ori Brafman, Raising Venture Capital, Rom Brafman, Scott Painter, Series A, Series B, Sway, Venture Capital, xconomy. You can follow any responses to this entry through the RSS 2.0 feed. You can leave a response, or trackback from your own site. Jeff Bussgang’s latest blog post on Ori + Rom Brafman’s book, Sway, is very useful for VC-funded entrepreneurs. Jeff goes on to discuss how loss aversion causes VCs to often put good money after bad, and how loss aversion causes entrepreneurs to not make tough firing decisions soon enough.